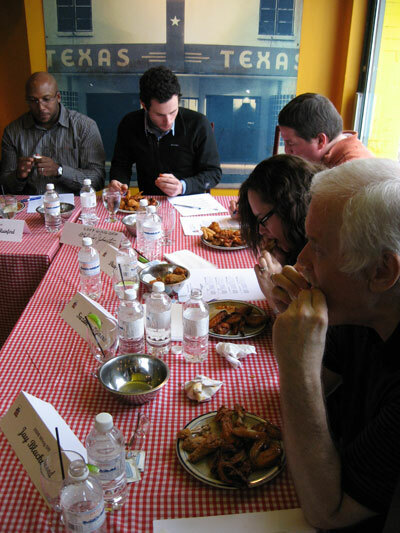 Robert Salnek, Robin De Groot, and Chef Robert L. Rainford meticulously judge each chicken wing. So who has the best chicken wings in Toronto? That’s just the question that Brian and Robert Salnek of the marketing company Northern Management sought to answer this Wednesday by organizing the first annual Toronto Wing-Off. “We had looked up reviews, and we found that there was no definite answer as to who had the best wings,” explained Brian. “The Americans make these things a chow-down—we wanted this event to be like a wine tasting, except for wings.” The event, which was hosted by Tortilla Flats, featured five contenders—Hooters, Jack Astor’s, Duff’s Famous Wings, St. Louis Bar and Grill, and the Crown and Dragon—and seven judges, including Chef Robert L. Rainford of Food Network Canada’s License to Grill and Robin De Groot, the former lead designer of the infamous Restaurant Makeover. Ten restaurants and bars were invited to compete, but since only five participated, we’re not sure if the contest definitively determined the city’s best wings—the winner certainly has bragging rights though. The event went smoothly, but it was not without its moments. 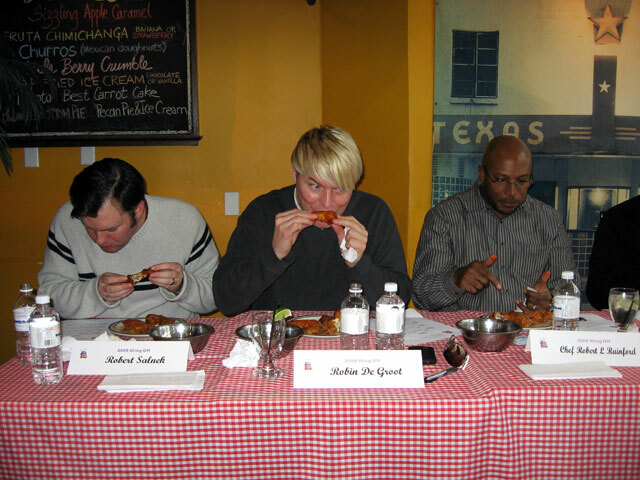 After the judges had finished the last round of wings, the waitress at Tortilla Flats brought out a plate of suicide wings made especially for De Groot, who had been complaining that the wings lacked kick. While De Groot managed to down the wings without incident, CityTV sports anchor Hugh Burrill went beet red after three bites. “I’m Irish—what are you doing to me?” yelled Burrill. “I think I need a tongue-ectomy.” We were offered some suicide wings, but wisely wussed out.